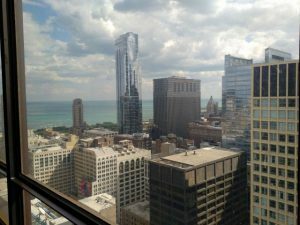 View looking to SW at Lake Michigan from the Daley Center 23rd floor after our staff environmental scientist successfully served as an expert witness for a client’s jury trial. Obviously we can’t discuss any of the details, but we were well prepared and the client’s legal council was excellent. Photo captured using 18 megapixel Blackberry PRIV android phone. September 2017.